Small reef aquaria offer numerous benefits and challenges to their husbandry. Their compact size affords the ability to create a densely-stocked coral and/or sessile invertebrate assemblage for a modest investment of time and resources, equates to a savings in utility bills relative to the requirements of larger systems, and makes placement of a flourishing captive reef biotope into rooms with limited space a simple matter. The primary challenges associated with caring for small reef aquaria are maintaining proper nutrient concentrations and resisting the temptation to overstock, overcrowd, and overfeed the system. Nano-reef aquarists will agree that a primary goal is to encourage the growth of the corals and other reef-building invertebrates being housed, and the relative rates of growth are largely dependent upon the availability of elements such as calcium, magnesium, potassium, and strontium, as well as upon the alkalinity being maintained within the proper range. Used in conjunction, NanoCode A & B provide the afore-mentioned elements, as well as the molecules forming the basis of alkalinity, in ratios that encourage the production of aragonite. 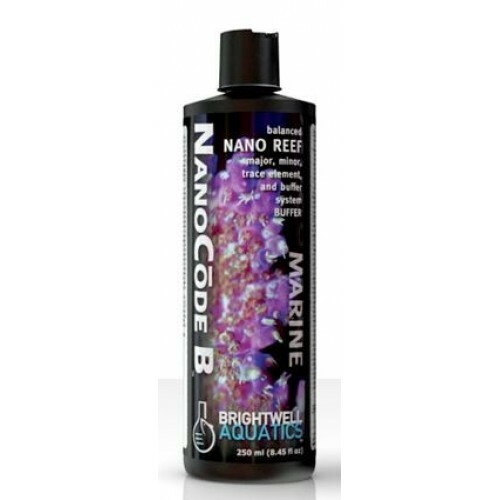 NanoCode A also provides non-conservative minor and trace elements in natural seawater concentrations to help simplify the maintenance of inorganic water chemistry in nano-reef aquaria. Neither NanoCode contains organic components such as vitamins, amino acids, etc., as these should be dosed separately (indiscriminately dosing these substances with a supplement meant to address high-bio demand elements such as calcium, or alkalinity, could lead to overloading the system with latent organic material, causing water quality to suffer; also, the rates of bio-uptake of the organic and inorganic components would need to be equal in order to avoid an overdose).